Both of these teams lost earlier on in the week, but this is going to be an ideal way for them to get that defeat out of their system and get back to winning ways. 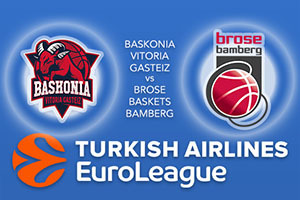 The Spaniards have a 4-3 record coming into this game while Brose Bamberg have a 2-5 record heading into Round 8, so the hosts will definitely start as favourites but that doesn’t always mean a lot in the Euroleague. The Spaniards were downed in Italy on Tuesday so they will be glad to get back home and try to get back to winning ways. Andrea Bargnani is the leading Baskonia player at the moment, picking up an average of 17 points per game this season and if he can have an impact on the match, there is a good chance that the hosts will find themselves back in the good books of their supporters. Another player that has been important for the Gasteiz squad this season has been Shane Larkin who has provided an average of 13.6 points per game this season. If these players click and hit form, it could be a big night for the Spaniards. There was so nearly a late win for Brose Bamberg on Tuesday night but they were shut out and this meant they suffered a narrow defeat to their Belgrade opponents. This was a cruel loss and it remains to be seen how well they bounce back in this game. Nicolo Melli was in fine form in that game, picking up 16 points and 10 rebounds for a double-double. This shouldn’t be a surprise as Melli has been leading by example for the Bamberg team this season, with an average of 12 points per game. There has also been strong support from Darius Miller, with an average of 14.9 points per game this season. The hosts should have enough to take this game and you should take Baskonia Vitoria Gasteiz at -6, which is provided at odds of 1.90. Anyone looking for the Over/Under market in this Euroleague game will find that going OVER 158.5 on offer at odds of 1.90 is a sound bet. Bet Now!